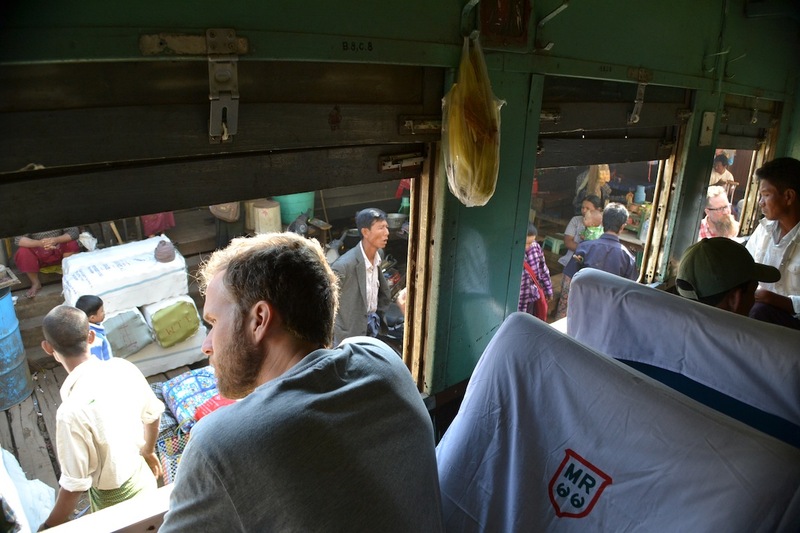 We arrived to Myanmar and spent two nights in Yangon/Rangoon, but as we’ll come back here towards the end of our time in Myanmar, we’ll capture all our experiences in the former capital then. 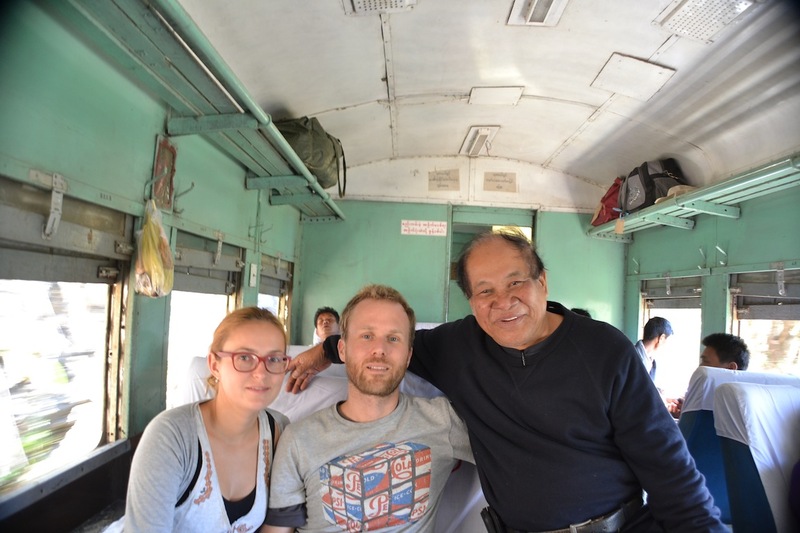 From Yangon we travelled north to see the beauty of Inle lake we had read so much about. 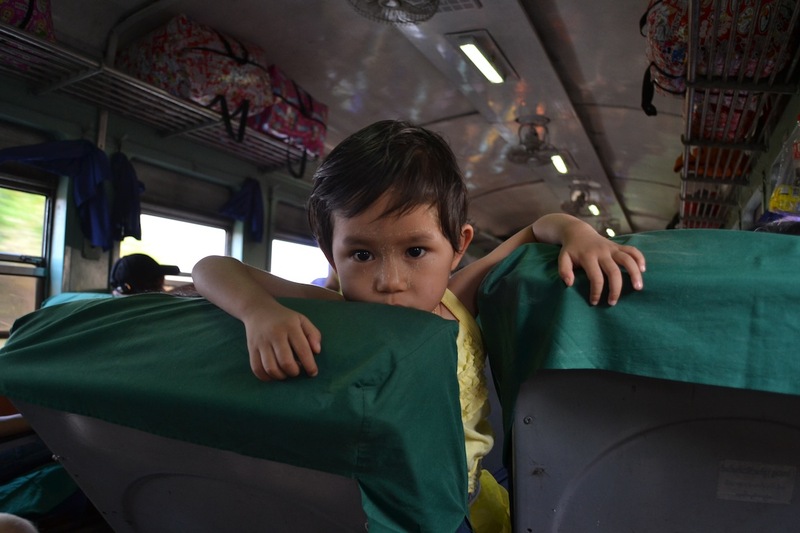 We love travelling by train, especially long distances. You see the country you travel through by day, you can get some sleep at night, it’s easier to start a conversation with people, you can get up walk around freely, train stations are always interesting and chances of accidents are generally quite low. 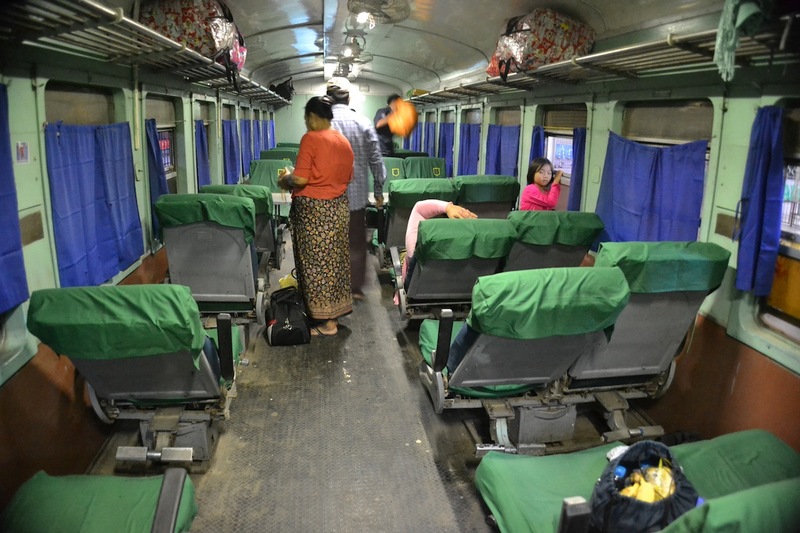 Although there were many obvious advantages of taking the bus from Yangon to Kalaw, including shorter travel time, lower price and most importantly it being privately-owned (vs the government-owned train), we still treated ourselves to another train experience. We didn’t regret it. 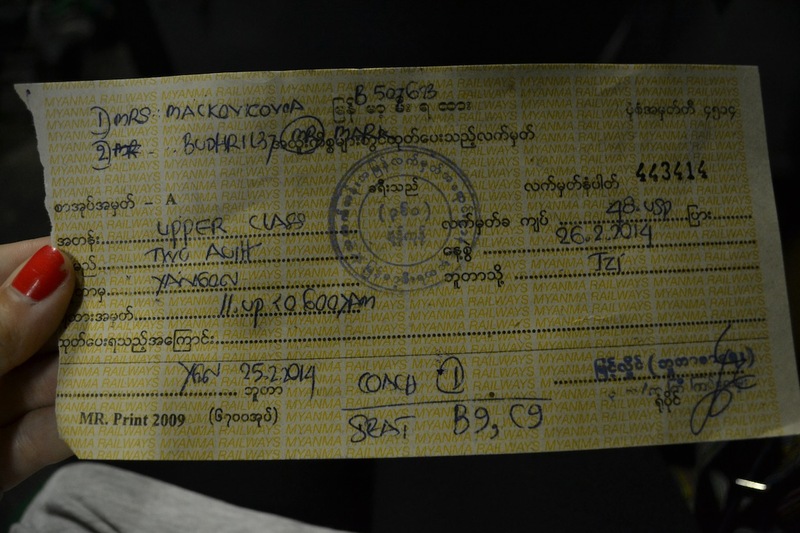 We sat down in our ‘upper-class’ seats just before 6am with our hand-written tickets that we had bought the day before at the ticket office behind the main train-station in Yangon. As always, bags in the ‘overhead compartment’, a bag full of fruit, nuts and water under our seat, we confirmed where the toilet is and with a big bang the train started moving. Twelve hours, many stops, many smiles and waves at kids besides the tracks and many bumps later we arrived in the town of Thazi where we checked into ‘Wonderful guesthouse’, one of the two available guesthouses (the other being Moonlight guesthouse right next door). We stopped here because we had to change trains in order to get to our destination, Kalaw. The next morning we took the 5am train and this trip was even better! 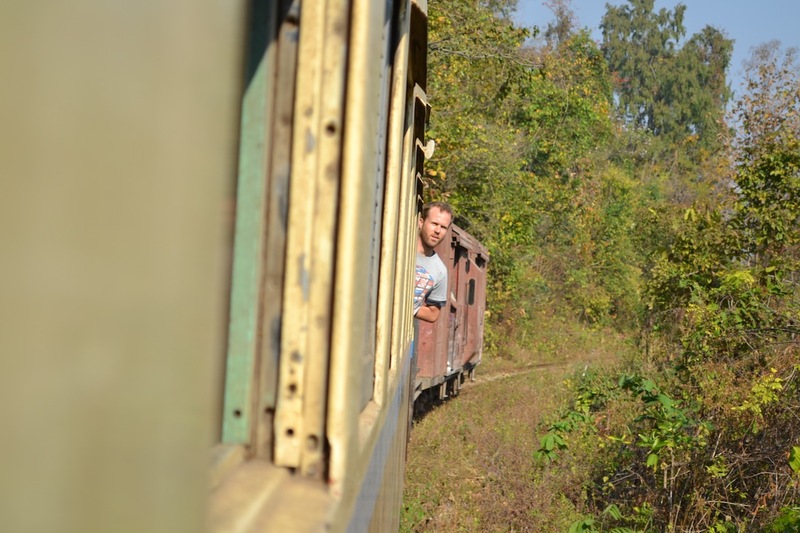 You should only take this train if you’re not in a hurry as we travelled about 100km in 6 hours… In an old dusty carriage with open windows we passed by small villages, vendor-filled train stations, thick forests and beautiful views of green valleys. 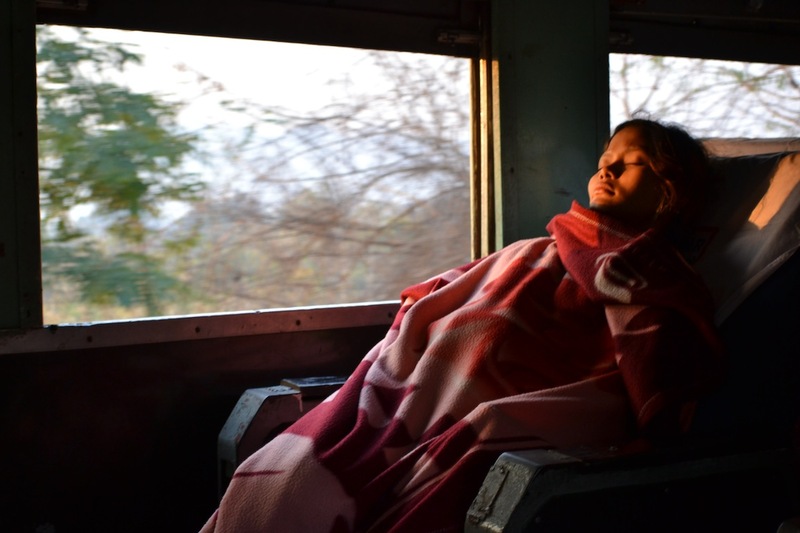 Because the train travelled so slowly you really got a chance to enjoy the views. At the train stations, through our window we bought watermelon, water and a plastic bag filled with delicious noodles. We chatted with two Americans in the seats opposite to ours and a local gentleman (who lived in Belgium for a while) explained us more about the area. Everything we like about trains came together! 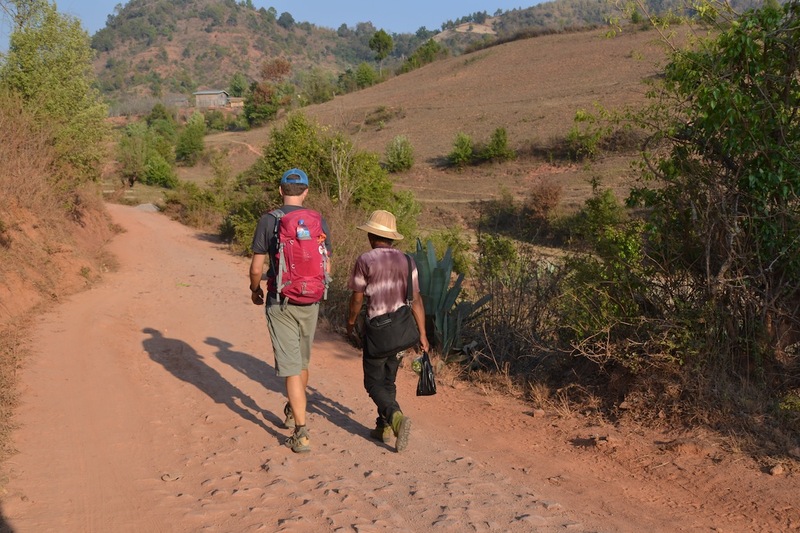 We mainly wanted to go to Kalaw because of a trekking-tour we had read about in the Lonely Planet. 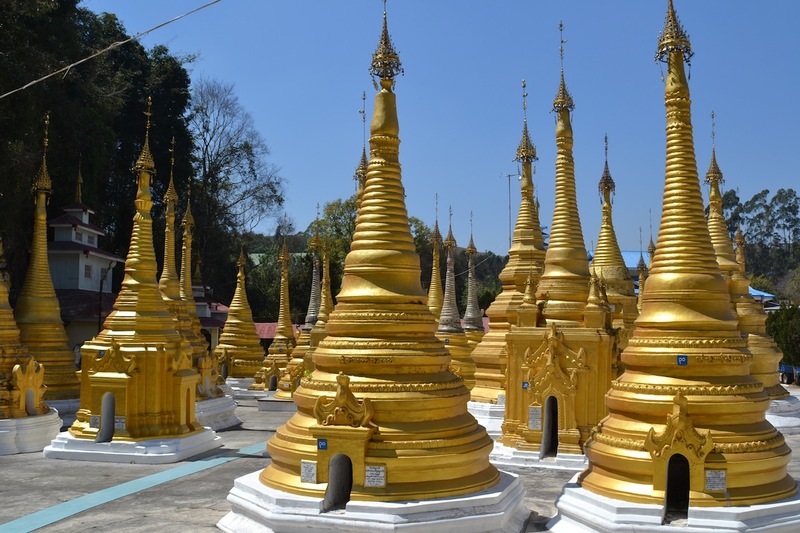 This tour would take us in three days through the countryside in Shan state from Kalaw to Inle lake. 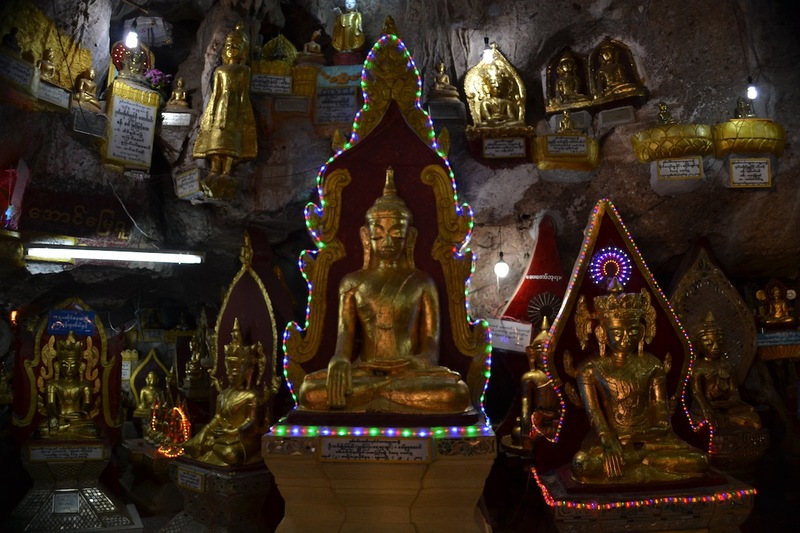 Before we went on our trek we walked around Kalaw and had a look in a cave filled with hundreds of buddha statues, ranging from small to big, wooden to golden, some decorated with what seemed like christmas lights. In the end we spent three nights in Kalaw in Pine Land Inn and also organised a guide through this guesthouse. Most of our stuff would be sent ahead to our next guesthouse in Nyuang Shwe so we only needed to bring the necessities. We have three main bags: Mark’s main backpack, Lucia’s main backpack and our smaller rucksack that we generally keep our electronics in and stuff that comes in handy during bus/plane/train trips. This last bag was too small for both our stuff, which meant we needed to take the next bag in line in terms of size….this resulted in Mark walking around with Lucia’s pretty pink bag on his back for three days, much to the delight of some fellow-tourists and probably villagers as well. After a big breakfast we started our 55 km hike spread out over three days. 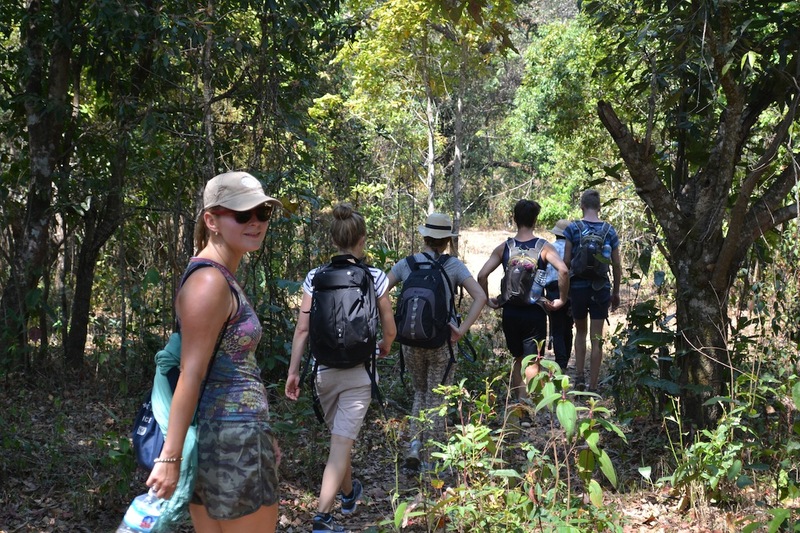 Apart from our Kalawian guide Poom-ya, we were joined by two holidaying Dutch sisters and two gap-yearing Danish guys. The average temperature during the day must have been around 30 degrees Celcius, so lots of water, sunscreen and hats. There is a pretty standard route that most tours take, with small differences between what village you visit/stay over and which path exactly you take. Generally the guides will try to ensure you visit all five main tribes in the area. We spent the night in two homes, whereas some of the tours also let you sleep in a monastery. Anyway, lets get the pics to do the talking, here’s what we saw! The scenery: Rolling hills with a mix of agricultural greenery, forests and very dry parts. People: It was summer holiday so kids were out everywhere! At our final lunch on day 3 we were done with all the walking! Just before lunch, as we entered the Inle Lake area, we had to pay the mandatory US$ 10 fee (or EUR 10, so make sure to have dollars!). The money goes directly to the current government so one doesn’t really want to pay this and also nobody checked us if we actually had paid this later on. In our opinion, it is easy to avoid paying. Just ask your guide to enter the area hundred metres down the road to avoid the cabin with the government official. If he has no obligations, he should be able to do it. Prve dve noci v Myanmare sme stravili v Yangone, ale kedze sa sem planujeme vratit pred odchodom z krajiny, povieme vam o nasich zazitkoch z tohoto byvaleho hlavneho mesta neskor. Z Yangonu sme sa vydali na sever za krasami Inle Lake jazera, o ktorom sme toho tolko poculi. Uzivame si cestovanie vlakom. Cez den sa mozeme kochat krasami okolitej krajiny a v noci si pohodlne pospat. Vo vlaku je vacsia sanca stretnut inych cestovatelov a vymenit si zazitky ci tipy, da sa chvilku poprechadzat sa, stanice su zaujimave a narozdiel od autobusov, ‘soferi’ nemaju moznost drsneho predbiehania. Aj ked cestovat z Yangonu do Kalaw autobusom ma niekolko vyhod, vratane kratsej cesty, nizsej ceny a toho, ze autobusove firmy su vacsinou sukromne (narozdiel od statnych vlakov), rozhodli sme sa dopriat si dalsie vlakove dobrodruzstvo. Nelutovali sme. Pred siestou hodinou rannou sme sa usadili v nasich sedadlach ‘vyssej triedy’. Rucne vypisane listky sme si kupili den predtym v kancelarii zeleznic za hlavnou vlakovou stanicou v Yangone. Ako obvykle, ruksaky si nasli miesto nad sedadlami, taska plna ovocia, orieskov a vody pod sedadlom, zistili sme, kam budeme chodit na zachod a s rachotom sa nas vlak pohol smerom do mesta Thazi. Po 12 hodinach, niekolkych zastavkach, mnozstve usmevov, kyvani deti z nastupist a poskakovania voznov po uzkych kolajniciach sme dorazili na miesto. Na noc sme sa ubytovali v hostinci ‘Wonderful guesthouse’ (na vyber sme mali z dvoch; druha moznost bol ‘Moonlight guesthouse’ hned vedla). Thazi bola nasa zastavka len pretoze tu sa prestupuje na dalsi ranny vlak do Kalaw. Tento vlak odchadzal o 5 rano a cakala nas este zaujimavejsia cesta. Ak na cestu do Kalaw nemate vela casu, tak takto nechodte. 100 km do Kalaw totizto trva asi 6 hodin. Stare zaprasene vozne s otvorenymi oknami prechadzali dedinkami, nastupistami plnymi predajcov obcerstvenia, hustymi lesmi a zelenymi dolinami s krasnyi vyhladmi. Kedze vlak isiel takmr krokom, scenerie sme si mohli poriadne uzivat. Na staniciach sme si cez okno kupili cerveny melon, nove zasoby vody a sacok plnychutnych rezancov. Pokecali sme si s parikom americanov, ktori sedeli oproti nam a s miestnym panom (ktory zil chvilu i v Belgicku), ktory nam co-to porozpraval o miestach, ktorymi sme prechadzali. Vsetko, co mame na vlakoch radi, sme na tejto ceste zazili! Hlavnym dovodom nasej cesty do Kalaw bola troj-dnova tura provinciou Shan smerom k jazeru Inle lake, o ktorej sme citali v sprievodcovi Lonely Planet. Pred turistikou sme stravili par dni v meste a v okoli navstivili niekolko zaujimavosti, ako napriklad jaskynu so stovkami soch budhu, velkych i malych, drevenych, kamennych ci zlatych, niektore dokonca zdobili akesi vianocne svetla. I ked neplanovane, v Kalaw sme nakoniec zostali 3 noci a byvali sme v Pine Land Inn, hostinci, cez ktory sme si tiez vybavili turu. Vacsinu nacich veci odviezli autom priamo do Nyuang Shwe a so sebou sme si brali len to najpotrebnejsie. Cestujeme s troma batohmi – 2 velke a 1 maly, ktory pouzivame na laptop, elektorniku a vsetko, co potrebujeme mat po ruke v autobuse ci lietadle. Kedze sme sa nevedeli zbalit do maleho ruksaku, museli sme si vybrat ten druhy najmensi. A tak pocas troch dni turistiky Mark putal pozornost dedincanov a turistov, ktorych sme cestou stretli, s Luciinym vyrazne ruzovym na chrbte. Ludia: Prazdniny v Myanmare zrovna zacali, takze vsade same deticky! Ubytovanie: Byvali sme v 2 roznych domoch: v prvom sme sa delili o poschodie s rodinou; druhy dom sme mali sami pre seba. Jedlo: Ranajky a veceru sme dostali tam, kde sme byvali a obed sme mali v restauracii po ceste. Zeleny caj vzdy a vsade. S kracanim sme prestali na treti den na obed. Predtym, nez sme si sadli k obedu, museli sme zaplatit povinne vstupne do oblasti Inle Lake – 10 dolarov (alebo 10 Euro, takze majte pri sebe dolare!). Peniaze idu rovno do ruk terajsej vlade (a teda junte) a tak by bolo lepsie neplatit. Navyse, nikto nas nekontroloval pocas celeho pobytu. Podla nas sa da tomuto poplatku vyhnut, ak poprosite sprievodcu, aby vas do oblasti vzal cestou, len o stovku metrov dalej a vyhol sa tak kabinke s vladnym uradnikom. Ak sprievodca nie je povinny turistov tadeto viest, mohlo by to vyjst. Po obede sme nasadli na dlhu lod so siestimi sedadlami jedno za druhym. Mark bol rad, ze mal so sebou stuple do usi, kedze jeho posledne sedadlo bolo blizko huciaceho motoru. Cakala nas hodina a pol plavby po prekrasnom jazere plnom malych lodiciek a rybarov. Pripravujeme separatny blog o tom, co sme vsetko videli a zazili na jazere, ale hore v poslednej galerii je prva ochutnavka. Vyber fotiek z turistiky najdete tu.